Just two days after Elon Musk promised (on Twitter) to hold a home-made commercial competition based on a 10-year-old’s suggestion, the company has launched the competition. 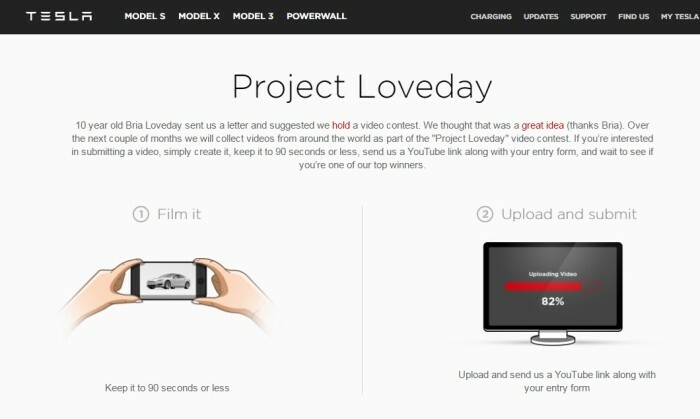 It named the competition “Project Loveday” in honour of the 5th grader Bria Loveday’s suggestion, and has started collecting videos from around the world until May 8, 2017. “If you’re interested in submitting a video, simply create it, keep it to 90 seconds or less, send us a YouTube link along with your entry form, and wait to see if you’re one of our top winners,” read its website. The submissions will be judged by Tesla personnel, who will choose 10 winners based on “originality, creativity, relevance to Tesla and its mission, and entertainment value.” They will be featured and shared on Tesla’s social media channels. Since Tesla’s announcement, netizens have been excitingly brainstorming ideas for their fan-made commercial. Many praised Musk for his now-famous openness to adopting fan suggestions. Elon will do what he says. I learnt that. Bank Simpanan Nasional (BSN) has released a campaign to encourage Malaysian youths to live debt free. ..